What is Cambridge Diet Plan and what are its Benefits? With the life style of the modern world, many people suffer from obesity and overweight. It even causes a lot of health problems in addition to slow physical appearance. To calculate whether you are overweight or not, you can check your Body Mass Index (BMI). For this you have to enter your height and the weight. If your BMI is below 20, it means that you are underweight. The correct BMI ranges between 20 and 24.99. 25 to 29.9 mean that you are overweight. If your BMI is between 30 and 39.9, you are seriously overweight and at the risk of heart disease or any other health problems. So must immediately take steps to lose your weight. BMI above 40 can also cause heart problems and premature death. In such cases you can consult a Cambridge consultant and take advice from him on how to lose your weight effectively. Cambridge diet is an effective diet plan which ensures that the person gets enough calories for his daily requirements and at the same time prevents consumption of excess food. You can customize this diet according to your taste and requirements. 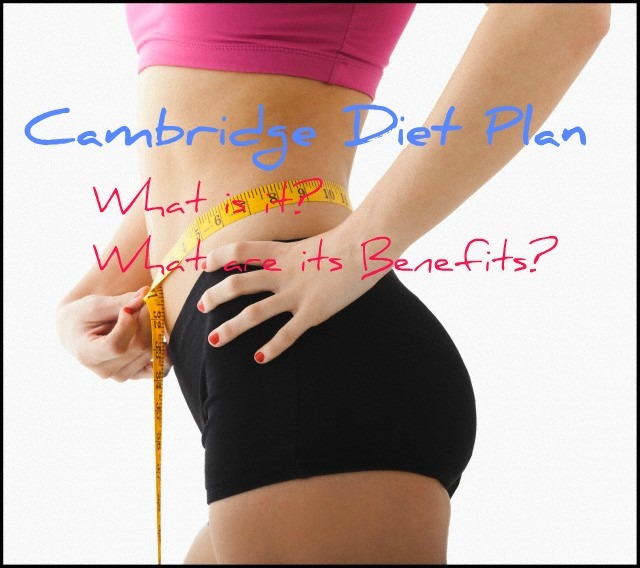 What is Cambridge Diet Plan? Cambridge diet plan includes six stages and you must study these stages well before you start on this diet. It is not necessary that you are to start from stage one. The stage from which you start the diet is determined by your body. You can either start from stage one or move to second or stage. Since this diet is not planned by dietitians, you have to consult a Cambridge diet consultant to clear all your doubts regarding this diet. The consult helps you in deciding from which stage you have to start the diet and how to follow it. You have to follow this stage for a minimum of one week and a maximum of 12 weeks. In this stage you have to stop taking your normal meals and instead take the Cambridge diet products. The Cambridge diet products include soups, shakes, porridges etc. The Cambridge diet consultant may also allow you to combine one regular meal with the Cambridge diet products. But the regular meal you take should not consist more than 200 calories. Stage 1 is all the more important for those who work sitting in front of the computers and so on, without much physical exercise. You can follow the second stage for a minimum of one week and a maximum of three weeks. This differs from the first stage because here you can consume Cambridge diet products in combination with protein rich food. At this stage you must ensure that your body gets 810 calories every day. This stage therefore slowly increases your calorie intake after the sudden reduction of calories in the first stage. Thus it increases the metabolic activities of your body and makes your body more normal. Two weeks after the second stage consists of the third stage. Here the calorie intake is again increases and you are to consume 1000 calories per day. The three meals a day include milk and salads as well. In this stage there is a reduction in the diet supplements consumed. The fourth stage does not have any fixed time period. In this stage you may take two meals consisting of Cambridge diet supplements and two meals that are regular and including milk. But a check on the intake of calories is done. This is the stage when your body gets back to normal. On the fifth stage you have to take 1500 calories every day. You may have on Cambridge diet product and regular meals for breakfast, lunch and dinner. However, you must keep the calorie intake under control. This is also a sustainable stage like the fourth stage. This is the final stage and you may carry on this stage for as long as you please. At this stage you must have lost the weight and attained the weight that you desired. At this stage you may have a balanced diet and you must take care to maintain the weight not to put on weight again. If you have the will power to stick to the diet and avoid calorie rich foods, you are sure to lose weight. If you are suffering from any illness or if you have any health problems, you have to consult a doctor before you follow this diet. Although there are various other diet plans that you can follow, Cambridge diet plan is very flexible and easier to follow. You may not cut all your desired food items when you go on this diet as in other cases. Moreover, this plan does not cause any sudden change unless you take the crash diet. It is slow but very effective. Once you get your desired weight, all you have to do is to maintain it properly and stay slim and beautiful.